Here is another question that came to me from a website visitor, but before I answer the question, I have to set the record straight on exactly who is allowed to work on electrical systems. My Father-in-Law changed the outlets in my kitchen in my apartment. He’s a Superintendent in another townhouse complex so he has some idea of changing outlets. What happens is that when we turn on the breaker, all the power to the outlets trip out. When we try it again the main power switch board in the hallway trips out leaving me with no power to our apartment. We checked all the outlets to see if they were installed correctly but we can’t figure out what’s causing the problem. Every time the breaker in the hall trips, we have to call the Super to reset the power but he won’t do it anymore. He says he’ll have to call an electrician to fix problem and will charge us, which is what I’m trying to avoid. The super said that one of the outlets has to be cut or something to do with copper. I don’t know what he talking about and he’s not very friendly. Anyhow, I hope that’s enough information. Any help would be greatly appreciated. I know exactly what the problem is here, but before I get to that, I need to point out a couple of issues with this entire situation. I’m going to have to side with your building Superintendent here. You should have, and should now, call an electrician in this case. 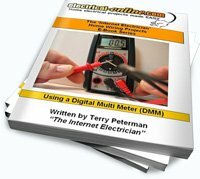 The only person that can work on electrical systems without being a licensed electrician or electrical contractor is a homeowner, within his or her own home. (Some areas have different, or even no rules on this, but this is how it is in most jurisdictions.) Then to protect yourself, others, and last but not least, your personal liability and insurance coverage, you need to have a homeowner’s electrical permit, and have the work inspected. Not even the building Superintendent should be doing electrical work, and that goes double for your Father-in-Law, a Super at another building! Now that the lecture is over, here is what went wrong. The kitchen outlets were wired as “split circuit” receptacles. 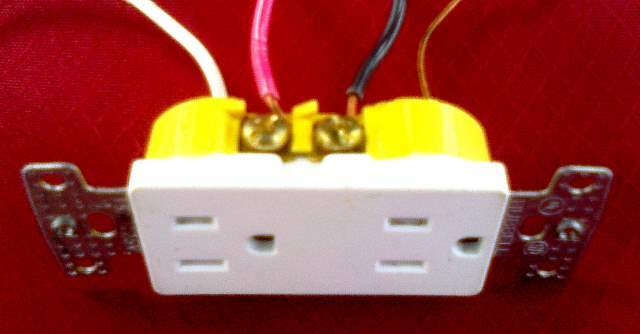 This means that each half of the duplex outlet is on a different circuit. What your building Super was talking about when he says that the outlets need to be “cut or something to do with copper”, he is referring to a small tab of copper that joins the 2 hot (and neutral) terminals together. Note the brass tab between the 2 terminals. On the hot (brass) side of these receptacles you most likely had a red wire on one terminal, and a black wire on the other. These wires come from 2 separate circuits (that should be fed from a 2-pole breaker) in the panel, and each circuit will be 120 volts when measured to neutral, but 240 volts between each other. These circuits share the neutral, but if the tab is not broken off, when the breaker is turned on you have a direct 240 volt short circuit condition, tripping the breaker. Note the tab has been broken off here between the red and the black wires. It’s just a matter of what breaker trips first, the one in your panel, or the one feeding the panel from the hallway as thousands of amps flow on a short circuit condition, more than enough to trip a 15 amp or a 100 amp circuit breaker. This entry was posted in Electrical Wiring and tagged broken tab, outlets, receptacles, short circuit, tripped breaker. Bookmark the permalink.